Small measures can already reduce expensive return rates. With the help of intelligent IT-solutions, retailers are able to handle large numbers of returns. 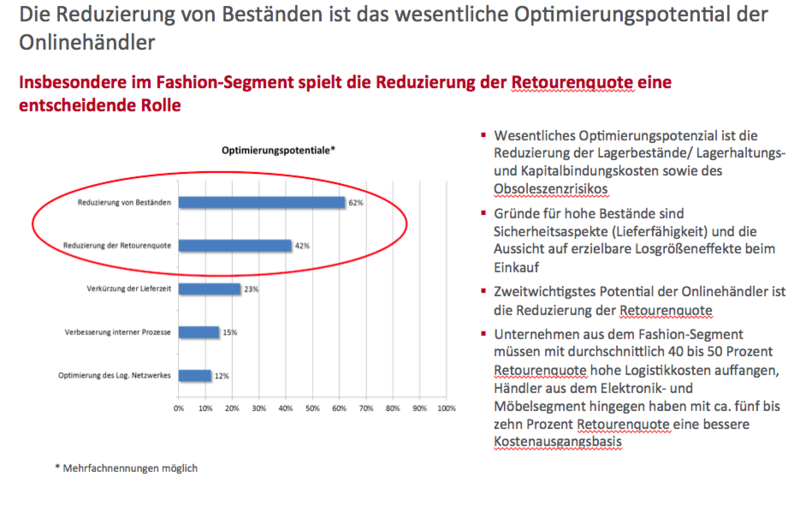 Karsten Fellbaum, SCM Manager at BearingPoint, notes that “successful returns management combines individual measures from marketing, purchasing, technics, and logistics”. 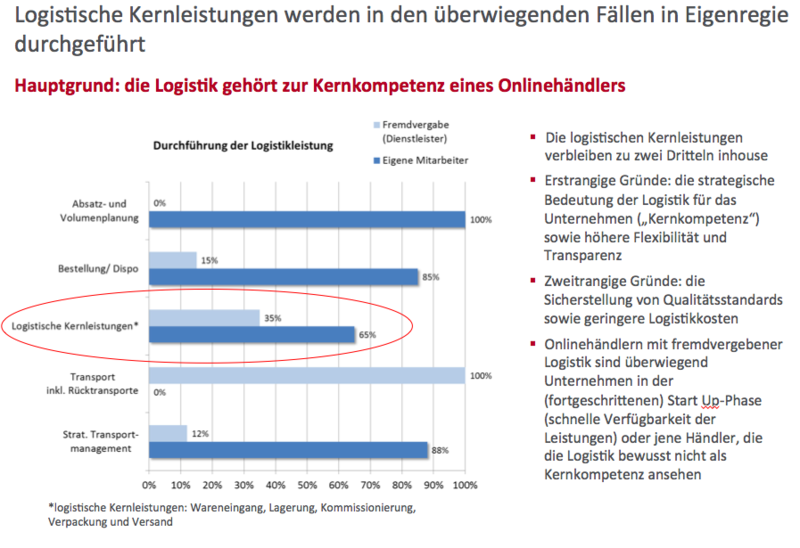 A current BearingPoint survey among 30 leading German online retailers shows that nearly half of the interviewed companies in online sales with in-house logistics and returns management see considerable need for the reduction of their returns. These present an enormous cost factor, and therefore weaken the profitability substantially. However, a target-oriented handling of returns is also a relevant factor for the success of a company, as it produces additional turnover. Many online retailers are not yet aware of the opportunity to use proactive returns management in order to make their online sales more efficient. Successful returns management combines individual measures from marketing, purchasing, technics, and logistics in a holistic approach and as an integral part of the logistics department. Therefore, many of the interviewed companies have already established – or plan to establish – these measures in the medium-term. These include customer friendly product specifications and additional information such as “for cinema enthusiasts” or “basic version” for TVs, as well as categories such as “fitted” or “casual, comfortable” for clothes. This should also include details on necessary accessories (e.g. batteries for electrical devices), such as system requirements and compatibility, as well as comparison charts for similar technical products. Within the fashion sector, technical applications that allow the uploading of personal photos or individual body and clothes sizes via webcam form the basis for a virtual fitting room (augmented reality), offering the possibility to present clothes in an even more descriptive and customer oriented way. Additionally, avatars help to promote products or product details based on short, descriptive video clips. In order to reduce returns in the shoe and clothes industry, 3-D measuring inside the shoes or articles of clothing could be used to generate figures that are more specific than the provided size indication of the manufacturer. 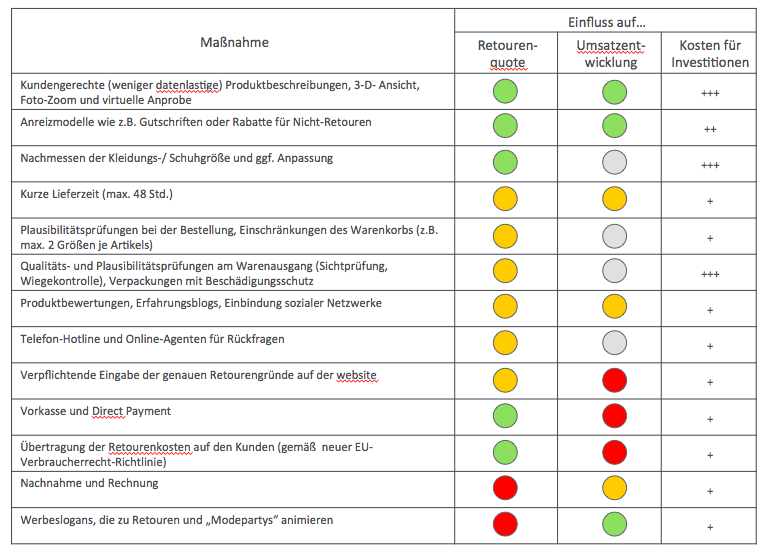 According to online retailers in this sector size indications of manufacturers are often inaccurate anyway and do not correspond with German sizes. An IT-system links newly ascertained figures to existing customer data. In so doing, the system would learn with every new purchase. It would learn with every purchase of properly fitting shoes or items of clothing, as well as in cases of improper fit. Customer product reviews and blogs that exchange experiences are other important tools suitable for all product areas, the effect of which is multiplied when linked with social networks. Uncertain purchasing decisions and duplicate ordering are reduced by multilingual customer services via telephone or web-call center. All additional product information and customer feedback can be accessed via the inventory control system, and information on the order status can be displayed in real time. To reduce the risk of returns due to damage, packaging with a high level of protection is used, and diligent quality checks for product and packaging are conducted before shipping. Furthermore, packaging should appear to be as high quality as possible, as brand-new cartons and properly fixed adhesive tape are associated with a positive shopping experience. Since products from the internet are often bought by impulse, they should be shipped within the specified delivery period. Long delivery times can lead to the customer questioning the purchase, returning the product, or deciding to buy the product from a different retailer with shorter delivery times. Combined incentive- and “punishment models” during billing help to reduce returns. For instance, customers that rarely return their purchases are rewarded with credit on their accounts, while customers with many returns are faced with warnings, some of which may threaten to block their accounts. It can be concluded that because of the high cost of returns, online sales would quite surely fail without appropriate regulations for returns.